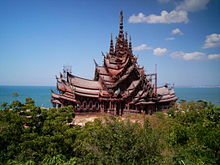 Sanctuary of Truth (Thai: ปราสาทสัจธรรม Prasat Sajja Tham) is a religious construction in Pattaya, Thailand. The sanctuary is an all-wood building filled with sculptures based on traditional Buddhist and Hindu motifs. The top of the building is 105 meters high, and the building covers an area of more than two rai. It features contemporary Visionary art based on traditional religious themes. The project was initiated as an idea of Thai businessman Lek Viriyaphant in 1981, and is scheduled to be completed in 2050. The main style of the sanctuary is based on the Thai architecture of the Ayutthayan period, richly decorated by Hindu-Buddhist hand-carved wooden sculptures drawn from various artistic traditions, including Dravidian, Angkorean, Chinese, Mon Dvaravati, Srivijayan, and Thai. It has four gopura, respectively representing images from the Buddhist and Hindu religions and mythologies of Cambodia, China, India and Thailand. According to the official website, its purpose is to use art and culture as "a reflection of the Ancient Vision of Earth, Ancient Knowledge, and Eastern Philosophy. Within this complex, visitors will understand Ancient Life, Human Responsibility, Basic Thought, Cycle of living, Life Relationship with Universe and Common Goal of Life toward Utopia". Wikimedia Commons has media related to Sanctuary of Truth. This page was last edited on 7 March 2019, at 19:20 (UTC).